The script writer, stage designer and interior designer Tapio Vilpponen graduated with a degree in interior design. However, he made his career mainly within the film industry. From 1939 until 1958, he worked for the Finnish film company Suomi-Filmi Oy as a PR man, and later as manager for the art and advertising department. Vilpponen was then employed as manager for the art department of the company Mainos TV. Vilpponen took part in several Finnish film productions. He was an actor, stage designer and a script writer. Sometimes he used the signature ‘Roy’. 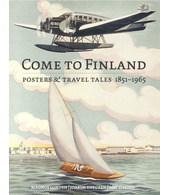 During World War II, Vilpponen designed many film posters. He is also reported to be the man behind the idea of the Jussi award festival, the Finnish version of the Oscars. Vilpponen himself won three Jussi awards. Tapio Vilpponen was also chief editor of many different film magazines. Furthermore, he was a columnist and wrote thrillers.